A VILLAGE love story has caused a stir in Mashonaland Central’s Mupfure Village after a local teacher married a herd boy in the area. The teacher, Kinedah Zhangazha, says finances are a secondary issue in life and all she was after was genuine love. Her marriage to the herd man, Percy Manyika, is still the talk of the village years after their union but both are astoundingly happy in their marriage. herd man,” said a straight-faced Zhangazha. “Proposing love and finally getting Kinedah Zhangazha as my partner was all due to God’s plan,” said Manyika who then turned to address his wife in the moment. “Kinedha Zhangazha, I am satisfied with your God given love, mostly the love you are giving to my child I brought in our marriage. I have never come home to hear that she was being abused any day or night. My daughter is happy, so am I. I have planned to thank you with a beast, ndichakupa mombe tsiru yechiredzwa yekurera mwana wangu uyu,” said Manyika. “Imagine he said he wanted a bicycle and capital for his chicken and road runner project. I financed the project. He uses his bicycle kunosvura rwodzi, delivering his birds, and he is making more cash than me, why, because God blessed our marriage after discovering that we naturally love each other for real,” said Zhangazha. “I now get more cash for our family that I told her that your pay is for your personal spending. I take care of her from hair to nails. I paid all the lobola cattle and I’m only left with one beast for the mother and one for the father, which I can give them both now because I have the money in my pocket right now,” said Zhangazha’s proud husband. His hard-work tendencies have made him look less like a school teacher but he is not bothered. “Daily, my wife tries to make me smarter but as a busy chicken farmer, it’s at times a challenge to maintain looks. Plus ndinonwa ka inini. My dream is to surprise my wife by stopping smoking and beer drinking. At present I smoke away from her, even at night or early morning, I wake up and go outside to smoke,” said Manyika who also rises early to provide warm bathing water for his family every day. “Imagine my husband gets more than $3000 per month, far much more than my net. He does not cheat me, he just takes his beer with his village mates. Haasati ambondiudza mashoko anondirwadzisa, or kundirova since we married,” she said. “Yes challenges can be there but not those serious ones, people from our both families used to pass some (negative) comments but we stuck together for more after every comment. We just keep quiet and become more focused on our marriage,” said Zhangazha. 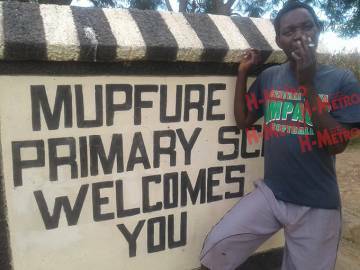 “Like at times my husband goes out for beer drinking and comes back late and we argue but when I hear him raising his voice as a drunken man, I quickly drop mine and keep quiet and talk about it later when he gets sober,” said the Mupfure School teacher. “We are looking forward to a white wedding and to invite H-Metro, Herald, Sunday Mail, Star FM, ZBC, and all media houses for a historic white wedding in Mashonaland Central,” she concluded.